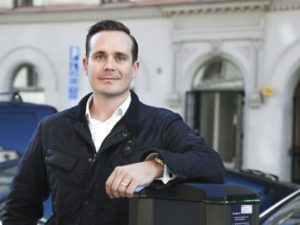 Vattenfall – a Swedish energy group – says partnering with fleet owners is a ‘must’ for electric vehicle potential to be realised across England as it launches in the UK. Head of Vattenfall e-mobility Tomas Björnsson said that the combination of Vattenfall’s investment plans and smart solutions for home, office and destination charging would boost confidence in the young EV market, increase competition, help tackle drivers’ range anxiety, support clean air zones in Britain’s cities and ultimately bring down costs for drivers. He added that a more open network is a ‘must’ if the EV potential is to be realised across England. Vattenfall hopes to achieve this by partnering with commercial developers, real-estate companies, industries, fleet owners and public bodies, such as local authorities to install charging poles around Great Britain. The company hopes to install its first ‘charging poles’ in the UK in June 2018 and is targeting all three charge point demographics – home, work and public – with its InCharge network. It is currently building an e-mobility team in Great Britain and a country director will join later next month. Pay-as-you-go will be implemented at each Vattenfall charge pole, enabling any plug-in vehicle driver to use the network in addition to roaming agreements the company is forging with other charge point operators or driver service providers, which are unusual in England but increasingly common in northern Europe where Vattenfall is headquartered.